Nest sites east of the Rockies are almost exclusively man made. There appears to be a long, strong human-martin bond. Native Americans in the east hung gourds for purple martins before white settlers arrived. Birds west of the Rockies nest almost exclusively in abandoned woodpecker cavities. It seems standing snags in beaver ponds were/are preferred sites in the West. Purple martins are large swallows reaching nearly 9 inches in length. The male is a dark, deep, rich blue above and below. He appears black at a distance. Females and juveniles are dark above with a whitish belly and grayish brown on the breast and throat. Martins generally have one brood per year. When nesting is over – which could be as early as late May in the Deep South or as late as September in Canada – these gregarious creatures congregate in large roosts before starting their southern migration. One roost in Lake Murray, South Carolina was reported to have more than 700,000 birds. It’s hard to tell what draws martins to a roost. Many are located over water, which would seem to protect against predators, but there are large roosts in urban areas like the Schumpert medical complex in downtown Shreveport Louisiana and Sharpstown Mall in Houston Texas, to name a couple. The Old North State is home to a large pre-migratory purple martin roost beneath the William B. Umstead Memorial Bridge (Old Manns Harbor) over Croatan Sound in Dare County. 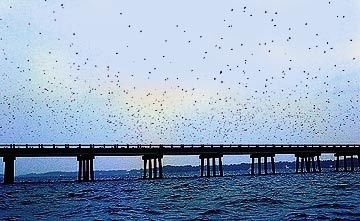 The roost is near the western end of the bridge and is home to around 100,000 purple martins. The roost generally peaks from around the end of July through the end of August when tens of thousands of martins funnel and swirl through the twilight vying for perches beneath the bridge. For general purple martin information and to learn more about how to assist in documenting pre-migratory purple martin roosts visit purplemartin.org.